There were a group of teenage girls hanging out at the mall today during lunch. Armed with cell phones and lip gloss they were ready to conquer the world. I watched a Dad in a BMW drop off the girls in front of the food court. When the car door opened the girls charged out. The Dad lingered and began calling his daughter. I watched as she rolled her eyes and slowly made her way back. I was paying more attention to the father daughter duo than my iced coffee and accidentally spilled some on my dress. I was hypnotized. Instantly my heart began to hurt, a little over five months ago my father died. He was my biggest fan, my best friend and unconditionally loved me for me. I watched as the father scolded the daughter for her very short shorts and “excessive” makeup. I watched the girl stomp her feet, her shoulders slouch and eventually her entire body grew tense. Her friends began to watch with me. We all stood there staring anticipating their next move. Eventually after some arguing and discipline the father drove away and the young girl skipped away with her friends. She seemed defeated and angry. I overheard her calling her father “Hitler” and “mean.” She was “so done” with her Dad. Didn’t she know her father was her biggest fan in life? Like this guy really wanted a bunch of pubescent girls in his new BMW on this beautiful afternoon! 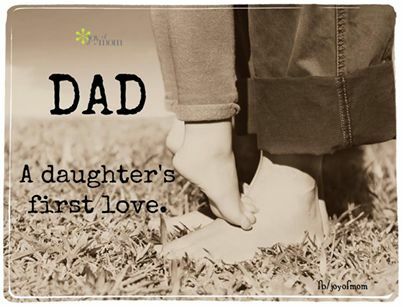 But that’s what father’s of daughters do they make sacrifices for their little girls and they love and protect them. This past weekend on the beach I quietly observed a family enjoying a picture perfect Sunday at the Jersey shore. Dad, Mom and their preteen daughter. My chair had a bird’s eye view of the family. Once again I observed like a creepy stalker. Instantly, I became mesmerized. I tried to not watch, but I couldn’t resist. This family reminded me of my own family many years ago. The Dad began telling his daughter he was not fond of her current boyfriend. The daughter like most young girls thought Dad was totally clueless. Her voice became high pitch and squeaky. The Dad’s voice remained calm and concerned. They sat facing the ocean discussing the daughter’s poor choice in boys for most of the afternoon. The Dad kept telling his daughter he “only wanted what is best for her.” At one point the daughter emerged from her beach chair and hugged her Dad. It was a sight for sore eyes, it reminded of my younger self. To the Dads….We need your patience, we need your support, but above all else, we need to know that you are in our corner, unconditionally. We are complicated and emotional but we will always need our Dads. A woman’s father is her first love, he sets the expectations for how a man should treat a lady. I’m blessed, I was given a lifetime with my Dad always on my side, always cheering me from the sidelines, always reminding me that I can do anything I set my mind to.